The mysterious Four Just Men are wealthy Europeans who move easily in high society but, capable of convincing disguise and brilliant acting, are as likely to be found on the street corners of London as at the dinner tables of Paris and Rome. They are the ultimate vigilantes. Their job is to exact justice where governments and police are hamstrung. They work outside the law – and set about their business with grim precision. This fast-moving little story and its accomplished reader takes the theme of vigilante justice out of this current polished, slick, technology-dependent world and brings it back to a simpler, more black-and-white one. By now, it’s a familiar trope: the laws of mankind are not sufficient to right the biggest wrongs, or to prevent the gravest evils, and so a few righteous people are required to set the world right again, to get revenge for the helpless, and to do it all in style. We have seen this theme crop up in comic books (characters such as Batman go where the police cannot), in movies (the Irish brothers of The Boondock Saints kill the sinful with panache), and on television (the title character of the Showtime series Dexter, murders the guilty who managed to escape society’s punishments), but maybe because Edgar Wallace’s The Four Just Men was written more than a hundred years ago, it is so original – so elementary – that it feels new again. Wallace’s vigilantes are four shadowy, vaguely criminal men who seek to correct the world’s ills, in this case by threatening to kill the British Foreign Secretary unless he blocks passage of an unjust law, one that would send foreign political criminals back to the corrupt lands from which they fled. The unfolding of the four’s scheme, the Minister of State’s reaction to their threats, and the work of the tireless police force to prevent the Minister’s death, all lead up to a suspenseful, almost comic-bookesque climax (and it will not come as a surprise that Wallace was a co-writer of the short story King Kong). 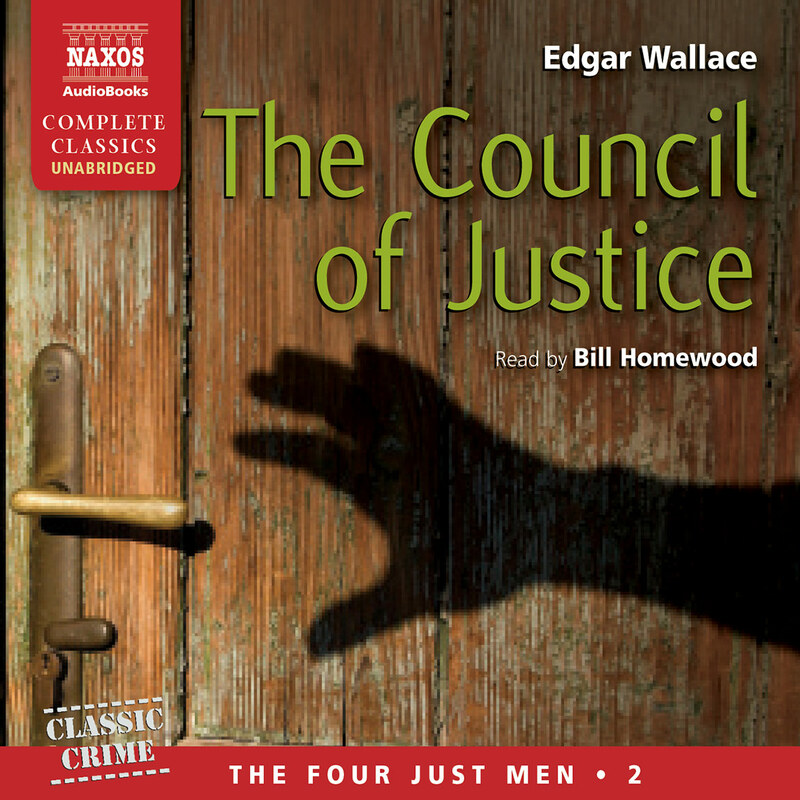 Given that Wallace wrote The Four Just Men in 1905, police procedure and investigation in this tale is far less advanced than the modern day – CSI, this isn’t – and the methods utilized by the vigilantes and the police in their respective quests may have seemed novel and inventive then, but are amusingly antiquated; for instance, this listener found herself mentally screaming, ’Dust for fingerprints!’ more than once. But this element just adds to the fun: rather than rely on decades of experience of police techniques, not to mention the discovery of DNA, Wallace’s police rely only on instinct. Reader Bill Homewood seems to revel equally in reading in the Spanish accent of one of the nefarious vigilantes, the bumbling tones of one of the dastardly members of parliament, and the proud, proper voice of the beleaguered Foreign Secretary. Bill Homewood, a longtime television actor, seems to be having as much fun reading as we are listening. This fast-moving little story and its accomplished reader takes the theme of vigilante justice out of this current polished, slick, technology-dependent world and brings it back to a simpler, more black-and-white one. 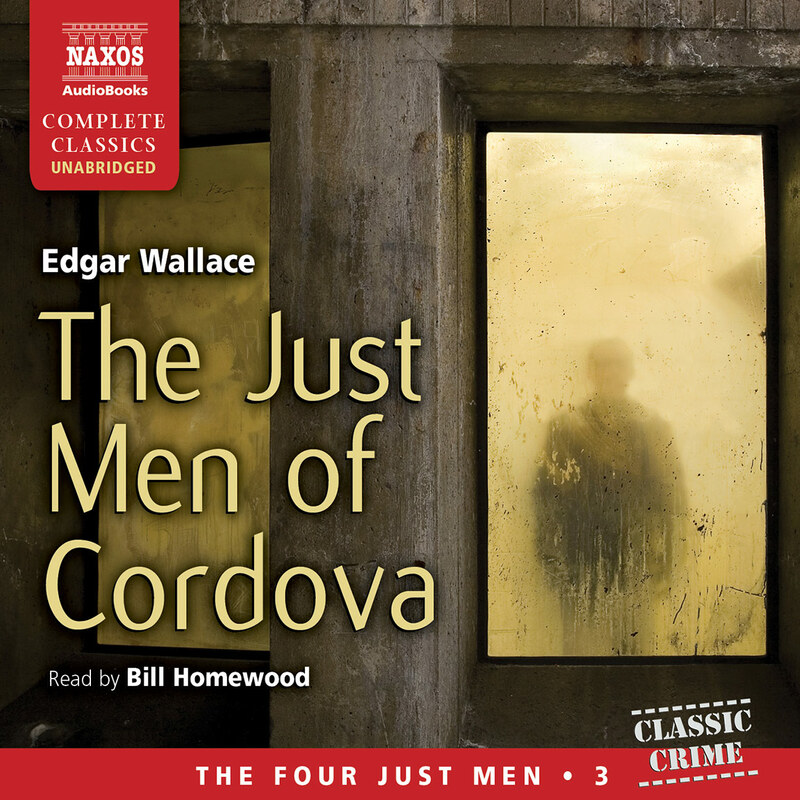 When it debuted as a newspaper serial in 1905, The Four Just Men was an immediate sensation in England due in large part to author Edgar Wallace’s clever promotion campaign. Unfortunately, he created an ill-considered concept as Wallace offered prize money to readers able to guess the solution to the mystery – but he didn’t limit the number of winners. So many figured out the answer that Wallace went into debt and left his publisher holding the bag. Still, the novel launched his career, led to a series of sequels, and ultimately the book was updated into a film in 1939 and a lavish TV series remake in 1959. Now 106 years old, The Four Just Men still commands critical respect, admittedly more for witty style and plot innovation than literary substance. It’s the story of three vigilantes with one reluctant collaborator publicly threatening to kill a British Minister if he doesn’t remove his support for an immigration bill they oppose. Scotland Yard is justly worried – the ’Four Just Men’ are suspected of 16 previous successful assassinations around the globe. While the characters and motives are thinly sketched, the suspense is what the story is all about – how can these men be caught if no clues exist and how can they carry out the most publicized murder of the century with Downing Street wall-to-wall with protective police protection? 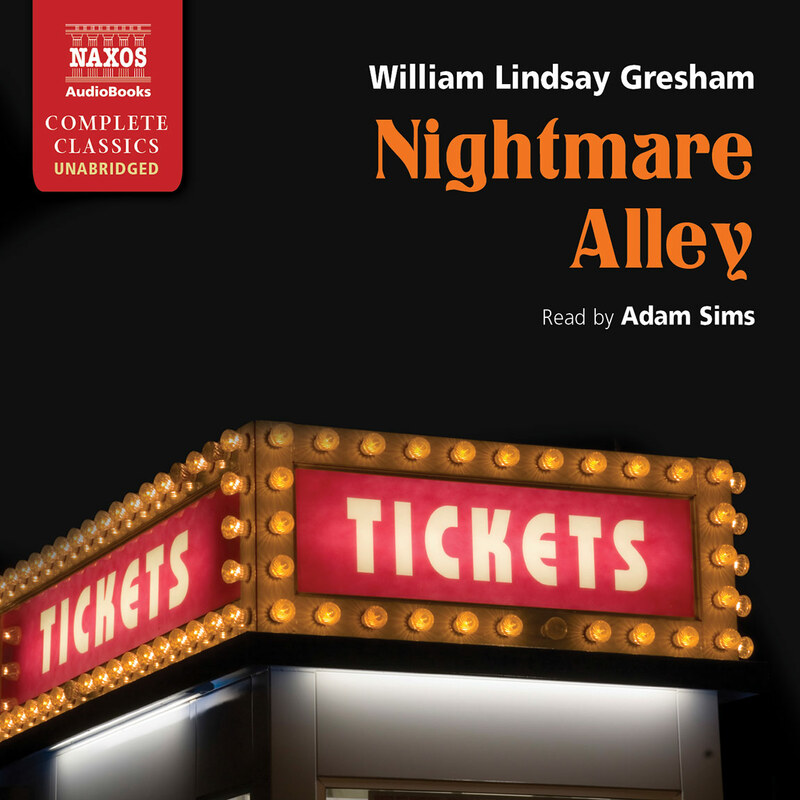 Another mystery for modern readers might be – why purchase an audiobook adaptation of this thriller when free electronic versions of The Four Just Men and its sequels are readily available on the net? The answer is reader Bill Homewood. 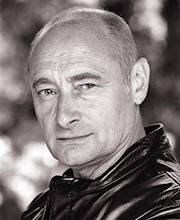 An actor with considerable stage, screen, and voice-over experience, Homewood uses a number of dialects and accents for the wide cast of characters with both British and European flavor. 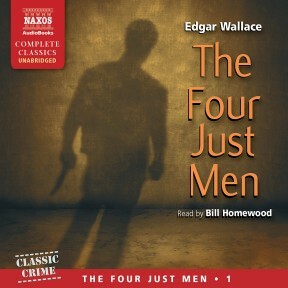 The different personalities of the ’Four Just Men’ are perhaps more distinctive in this audio version than on the printed page as Wallace provided little in the way of character description or back-story. Homewood not only gives the main protagonists individual presences, but the detectives, government officials, and other supporting characters come alive with dimensions more fleshed out than in the original dialogue. Four men sit around a café table in Cadiz discussing business – the business of murder. Thus begins Wallace’s classic 1905 thriller about a quartet of ruthless, glamorous, rich international vigilantes who call themselves the Four Just Men. How it came to be published is as exciting as the plot, but let’s start with the story. Sir Philip Ramon, the British foreign secretary, ’a firm, square-jawed, big-mouthed man with that shade of blue in his eyes that one looks for in peculiarly heartless criminals and particularly famous generals’ (you can tell right away that Wallace cut his literary teeth in Fleet Street), receives a death threat. The letter politely explains that, unless he persuades the government to prevent the proposed Aliens Extradition Political Offences Bill from becoming law, he will be assassinated. It is signed simply ’Four Just Men’. Why Manfred, Gonsalez, Poiccart and Thery want the bill quashed isn’t that important – something to do with the Spanish succession. What keeps you listening to Homewood’s impressive range of European accents is the dazzling resourcefulness and audacity of the plotters. They leave bombs in the members’ bar of the Commons. Freshly licked envelopes arrive on editors’ desks with instructions to… but enough; chill your own spines. It was first serialised in the Daily Mail with the promise of a cash prize to whoever came up with the correct solution to the mystery. Wallace agreed to underwrite the prize money himself. He was a hugely popular writer; in 1920 it was reckoned that a quarter of the books read in Britain were his, but alas, that didn’t make him a businessman. He omitted to notice that the small print of the competition rules did not limit the number of winners. The book was a bestseller, but he died penniless while working on the script for his best known film, King Kong. I’d call that rough justice. Edgar Wallace was one of the early thriller writers, known to us more from the movies than his books. In his Four Just Men series, the villains are four men who practise vigilante law. While their actions are outside the law, which one cannot approve of, there is a certain sympathy for their actions. 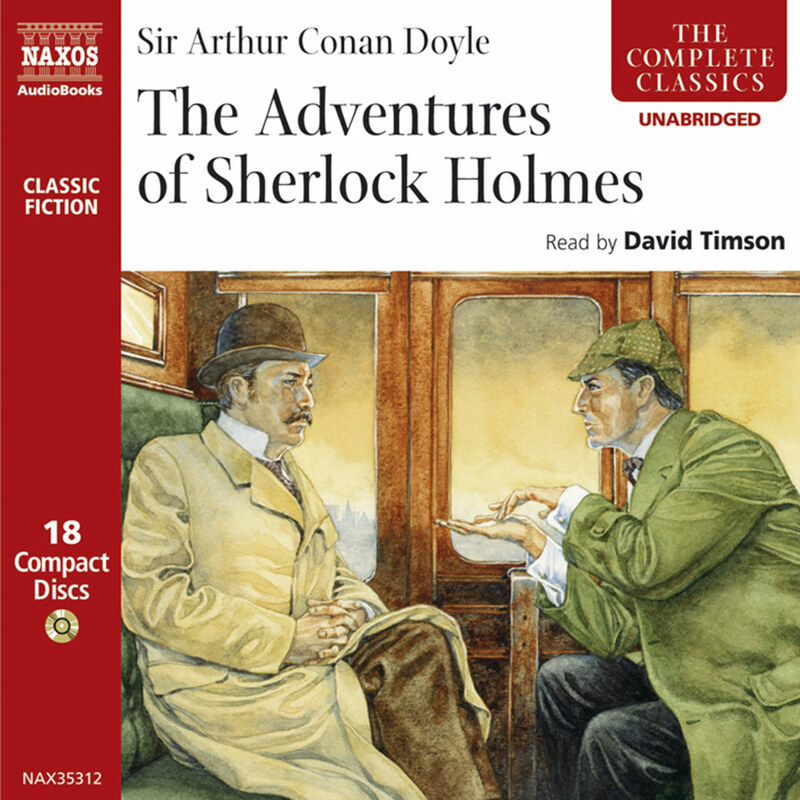 Read with perfection by Bill Homewood, the first in the unabridged Naxos AudioBooks Classic Crime series of that title takes us to the London of 1905, where the police hunt four men determined to right wrong with violence. Most thrillers offer the reader an escape into a world where the pursuer of justice, often a detective, is a good person; his quarry a bad one. The stories may be more or less complicated (e.g. John Grisham’s novels), the subjects may be parochial (e.g. Agatha Christie’s novels) or they may involve international intrigue (e.g. Andy McNab’s novels) but on the whole the villain ultimately suffers the consequences of his actions, and justice triumphs. One does not have to look far in adventure films and literature to find glamorous heroes with questionable methods (for example Barry Eisler’s hit-man thrillers with titles like Blood from Blood and One Last Kill, Alexandre Dumas’s The Count of Monte Cristo, Johnston McCulley’s Zorro, innumerable war films of heroic and bloody retribution, and, of course, cowboy classics such as The Magnificent Seven). These appeal to the vigilante in all of us. Who has not dreamed of super revenge on a school bully, an unpleasant teacher, a traffic warden, a treacherous colleague? Perhaps, in twenty-first-century literature, the equivalent of The Four Just Men might be the action stories of our Special Forces heroes on so-called ‘deniable operations’, where we are led to believe that governments prefer to wash their hands of the illegal action – an abduction, an assassination – rather than admit to having ordered it. In such books we love the cautious, wicked methodology of killing – the plotting and creeping, even the dreadful moment itself. What is extraordinary is that we are following these events from the point of view of the assassin, who is honourable only because he is on government duty. It is great fun, and possibly the best sort of holiday reading, to be vicariously criminal. We enjoy suspending the ordinary morality which we apply to our everyday lives in our schools, colleges and workplaces, and replacing it with this ‘naughty’ morality, where the end justifies the means. George Manfred, Leon Gonsalez and Raymond Poiccart are wealthy Europeans who move easily in high society but, capable of convincing disguise and brilliant acting, are as likely to be found on the street corners of London as at the dinner tables of Paris and Rome. Like Dumas’s The Three Musketeers, they recruit a fourth person, and, by means of ingenious plotting and perfect timing, always a step ahead of the police, they never fail in their task. They leave false trails and provocative notes, often teasingly pulling off extraordinarily complicated, even ritualistic, murders under the very noses of the police. It is probably the swagger and assurance with which the Four enact their crimes, rather than the justice of the punishment, which attracts our awe. We allow you until tomorrow evening to reconsider your position… If by six o’clock no announcement is made in the afternoon newspapers of your withdrawing this measure we shall have no other course but to fulfil our promise. You will die at eight in the evening. The first intimation of their intentions had excited widespread interest… But here was the hidden terror in the metropolis itself. Why, argued London, with suspicious sidelong glances, every man we rub elbows with may be one of the Four, and we none the wiser. Wallace is skilled at evoking an atmosphere of fear. In the wake of terrorist attacks on major cities in more recent times, his prescient ‘hidden terror in the metropolis’ has resonances for today.